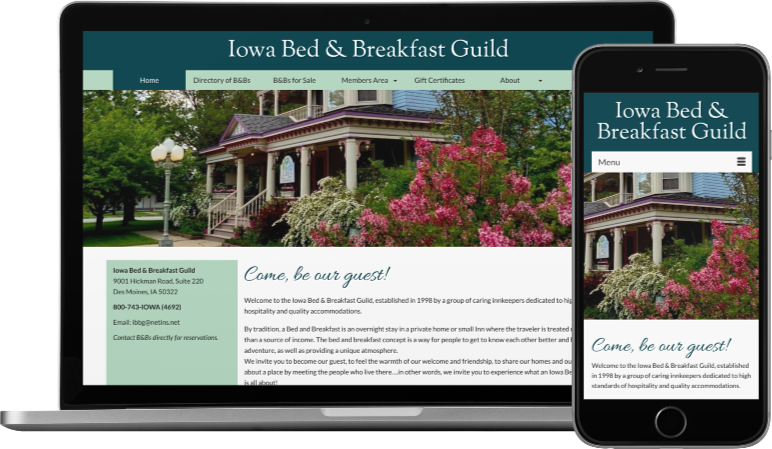 The executive director of the Iowa Bed & Breakfast Guild contacted me with a need to update an older website that was not mobile friendly to a new design with a searchable directory of B&B member properties around the state. We developed a template for member properties and made it easy to add new properties as they come along, following the same style. Each of these pages links out to the member’s own website, if they have one, giving it additional visibility. In addition to the member directory, we added a “search by city” table and a clickable dynamic map. Visitors can also purchase gift certificates online, integrated with PayPal.